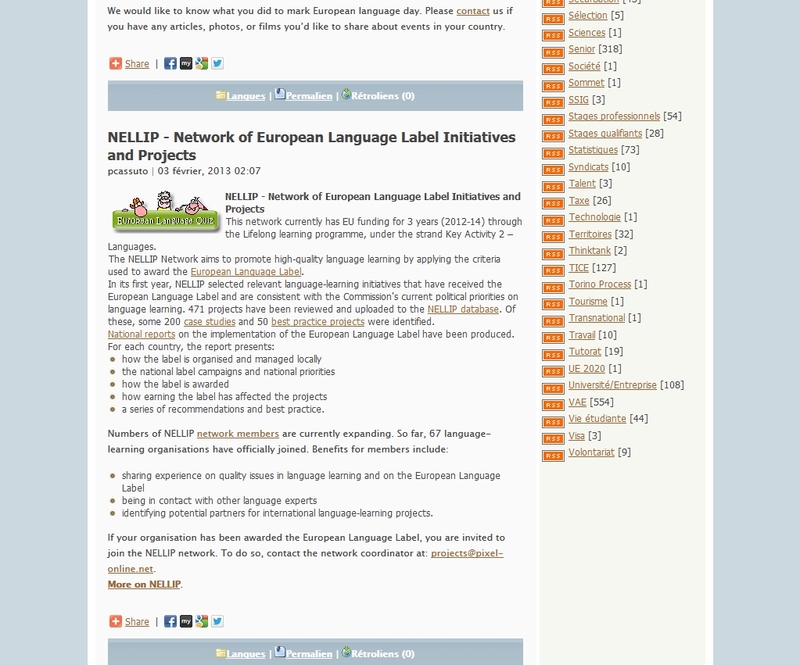 The European Commission’s Multilingualism Unit’s web site has published the information about the NELLIP network in four different languages. A link to the NELLIP portal has been made available. 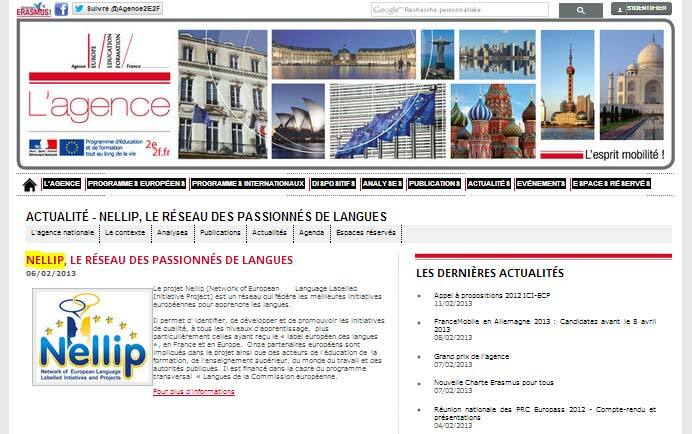 The French National Agency in charge of the Lifelong Learning programme and of the European Language Label has published an article about NELLIP. 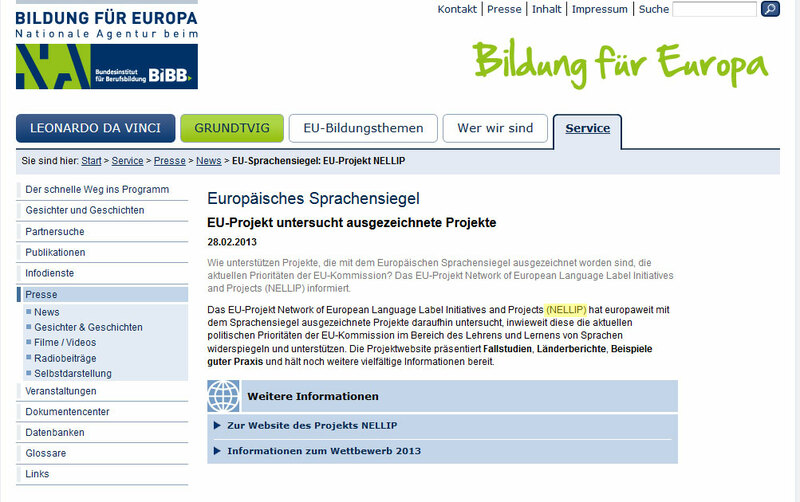 The German National Agency in charge of the European Language Label has published an article about NELLIP in its press section. 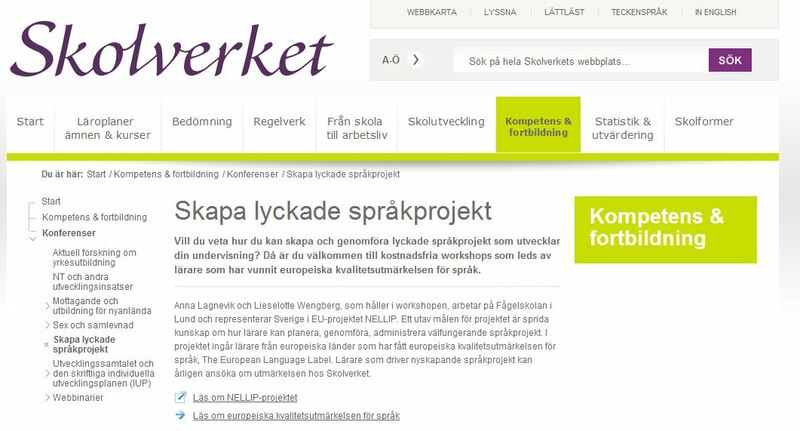 The Polish National Agency in charge of the Lifelong Learning programme and of the European Language Label has published an article about NELLIP. 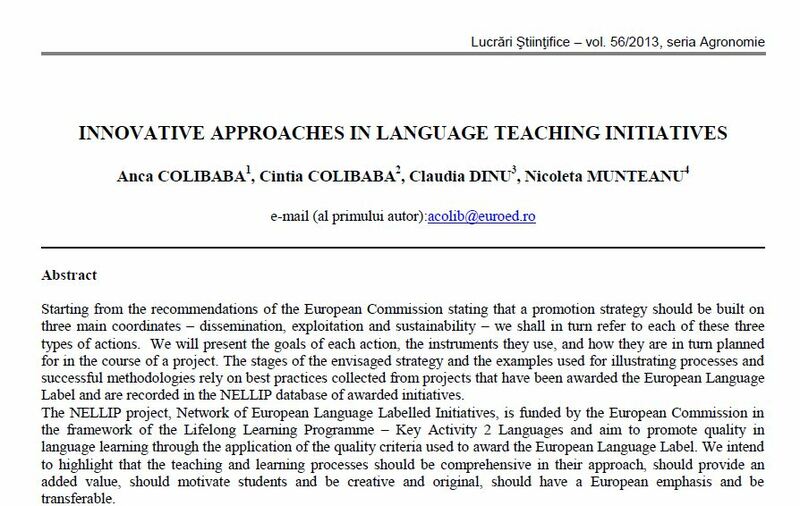 The Romanian National Agency in charge of the Lifelong Learning programme and of the European Language Label has published an article about NELLIP. 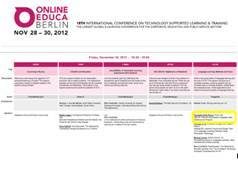 Online Educa Berlin Conference web site is listing the paper that will be presented in November 2012 about the NELLIP network. A link to the abstract of the paper on NELLIP is also available. Eurodesk operates with the support of the European Commission and the Department of Youth and the Italian National Civil Service at the Presidency of the Council of Ministers. 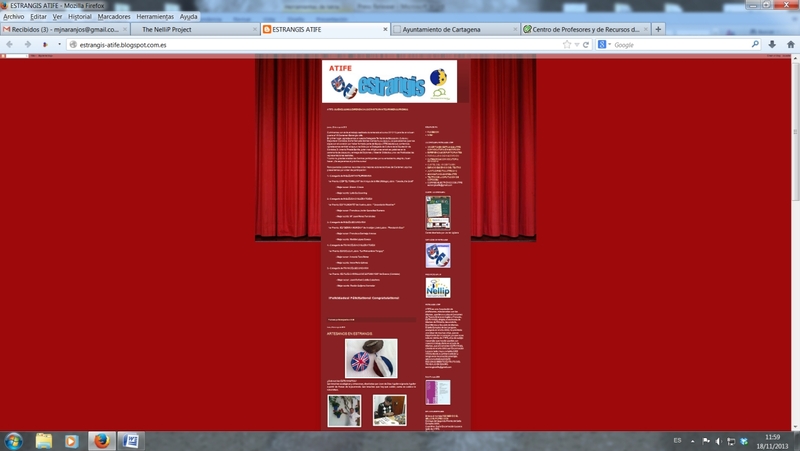 The main information about NELLIP is provided together with a link to the NELLIP portal. 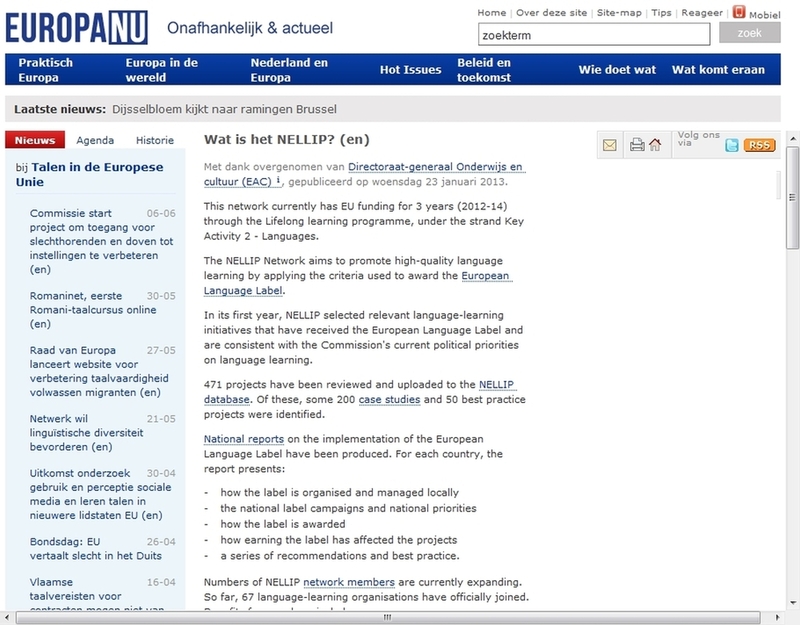 The Poliglotti4.eu project that has been working for more than a year on behalf of the European Commission on multilingualism in Europe has introduced the NELLIP network in the Media Centre section. The aim of this site is to offer an efficient tool for teaching and learning Hungarian Sign Language to hearing people. 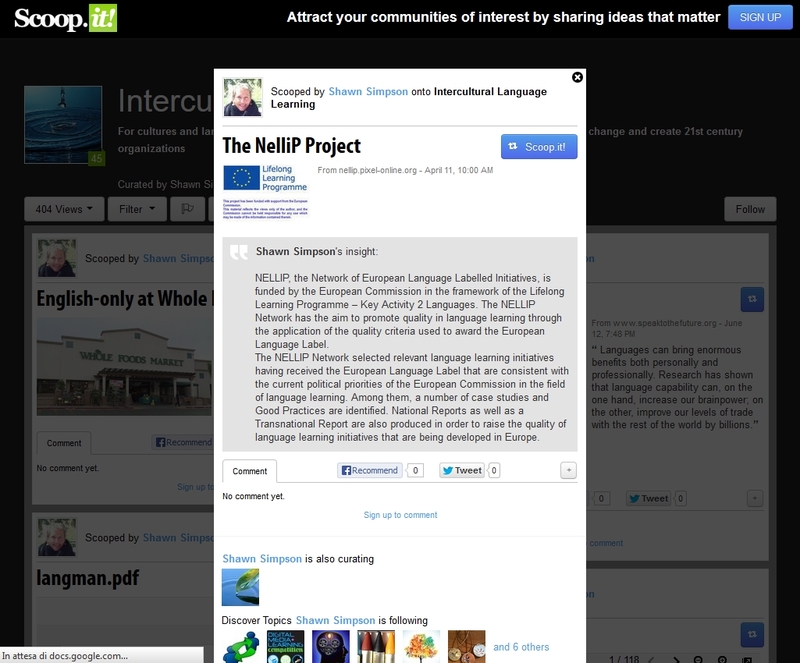 A link to the NELLIP project has been uploaded in the “Useful links” section. 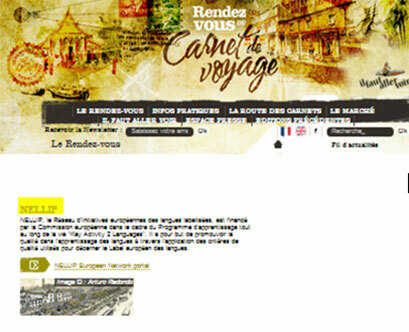 Rendez Vous du Carnet de Voyage, a travel book published on Hypotheses.org, is one of the tools developed in the framework of the “Carnet de Voyage” project which awarded the European Language Label in 2011. 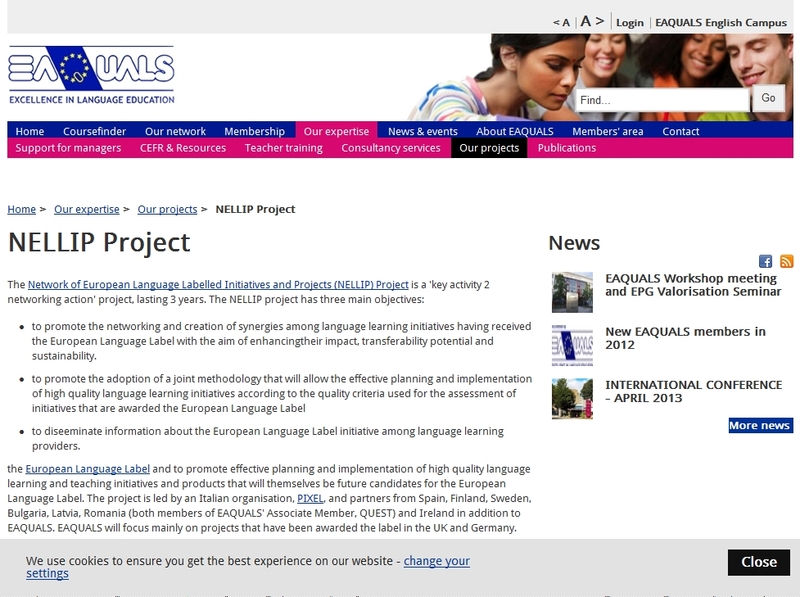 A description of the NELLIP project and a link to the web site has been uploaded. 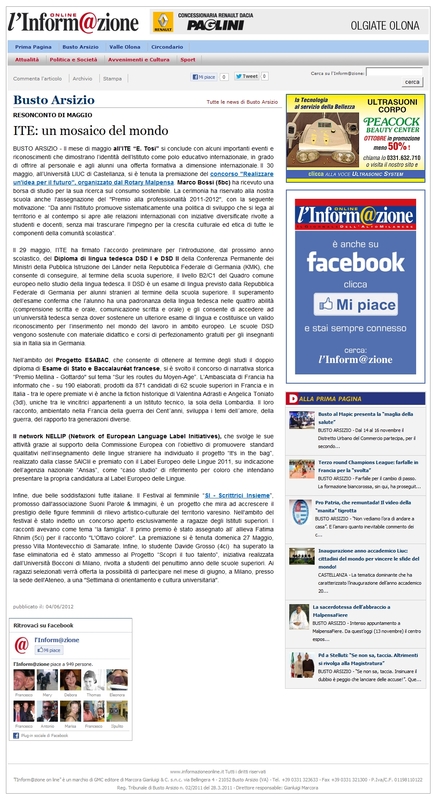 L’[email protected], an online magazine focusing in particular on events in the north of Italy, has published the information about the NELLIP network in its May 2012 issue. The objectives and expected results of NELLIP ate presented. HEEL Europe is a portal for young people with relevant information on Europe. The site offers background information on European policies as practical information, job opportunities, grants, and call for proposals. The main objectives of NELLIP are listed and a link to the NELLIP portal is indicated. EuroPlan is a web site focusing on European cooperation opportunities in the field of education, training, culture and research. 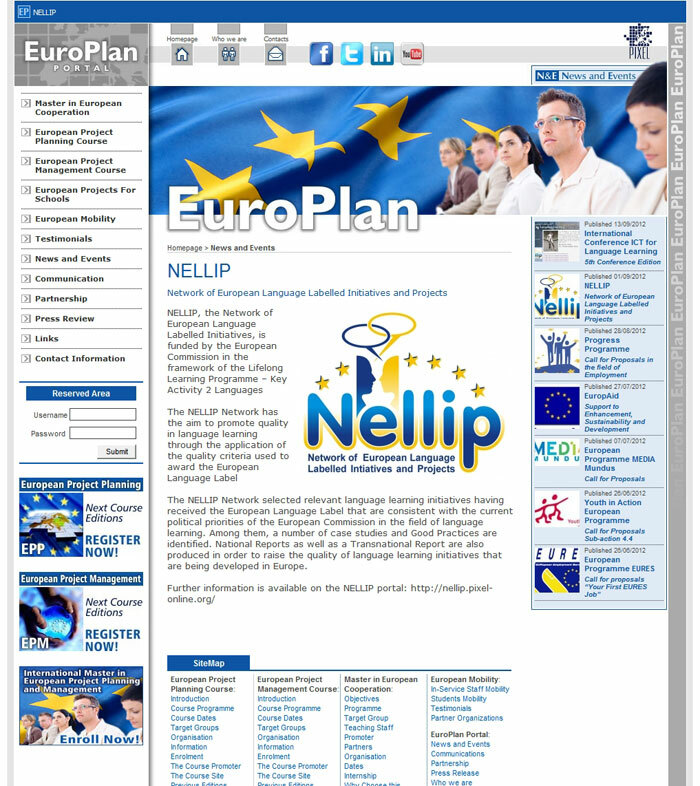 The information about NELLIP and a link to the NELLIP portal has been published on the News section of the EuroPlan portal. Evaluation and Accreditation of Quality in Language Services is an international association of institutions and organisations involved in language education. 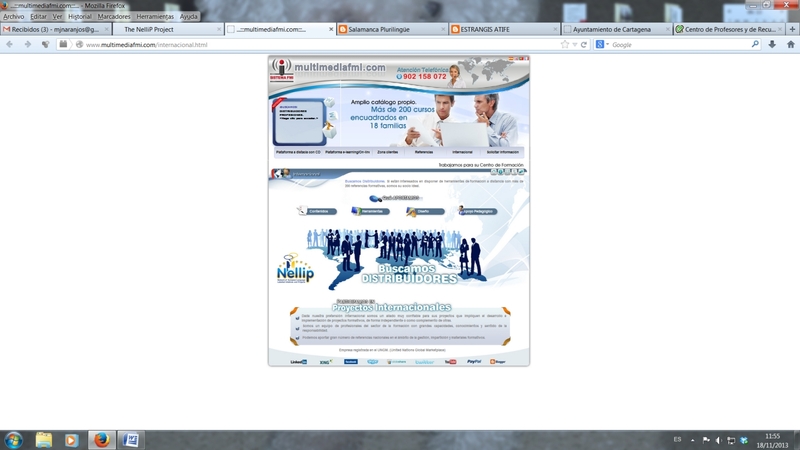 The description of the NELLIP Network was published in the Our Projects section of their web site. 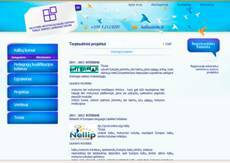 The main information about NELLIP is provided together with a link to the NELLIP portal. GEXCALL is the Team specialized in computer assisted language learning at the University of Extremadura in Spain. A description of the NELLIP network has been posted in the English version of their web site, the main information about the network is available as well as links to each of the contractual partners’ web sites. 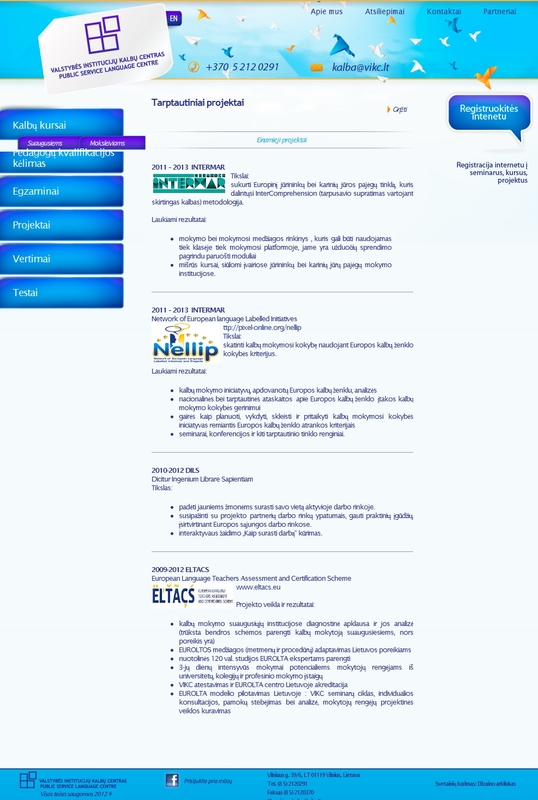 Public Sevice Language Centre in Lithuania, has published the information about the NELLIP network on their web site. The main objectives of NELLIP are listed and a link to the NELLIP portal is indicated. Pixel, the NELLIP network coordinator, is an education and training institution specialized in transnational cooperation. 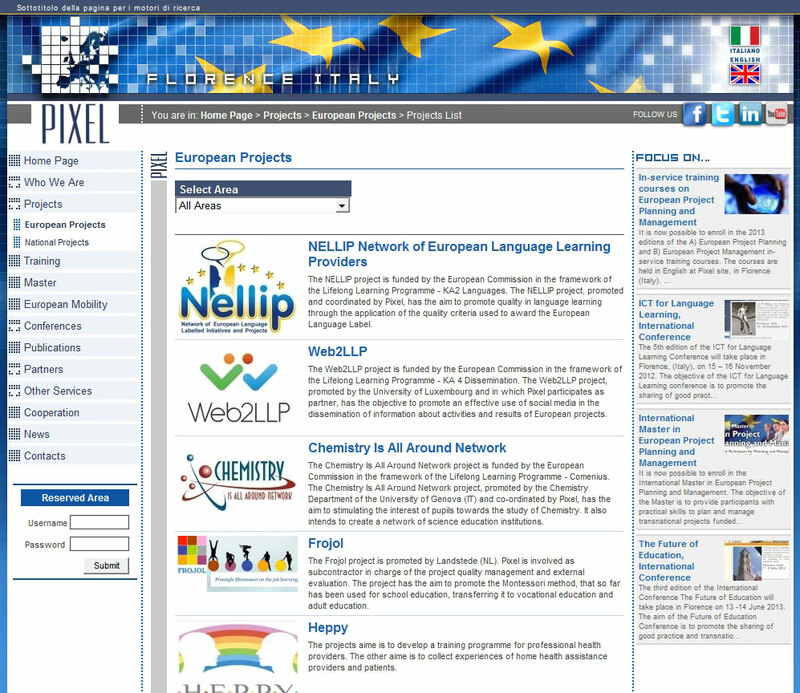 The description of the NELLIP network project as well as a link to the NELLIP portal were published on the European Projects section of the Pixel web site. 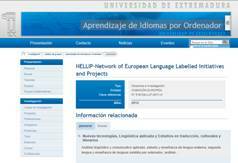 The University of Extremadura in Spain has published the information about the NELLIP network under their Projects section. The official information about the initiative is published as well as a link to the NELLIP portal. Prosper-Ase is a language centre, whose aim is to provide high quality language courses and translations and to support students and teachers to develop both personally and professionally. 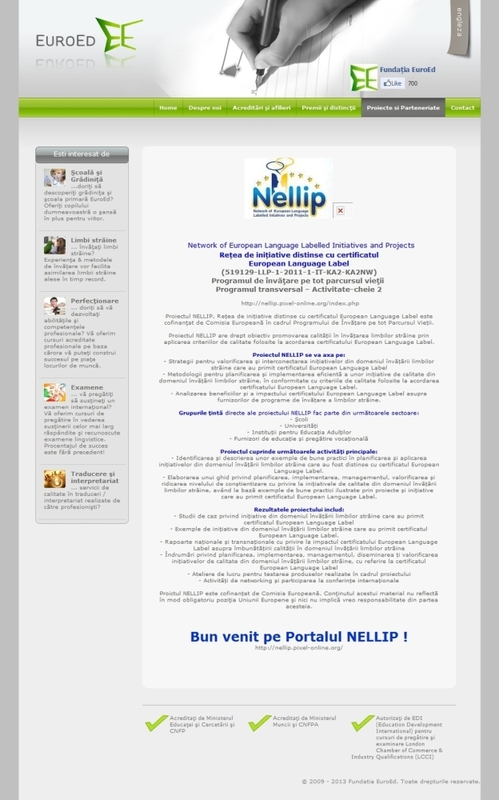 The main information about NELLIP is provided together with a link to the NELLIP portal. 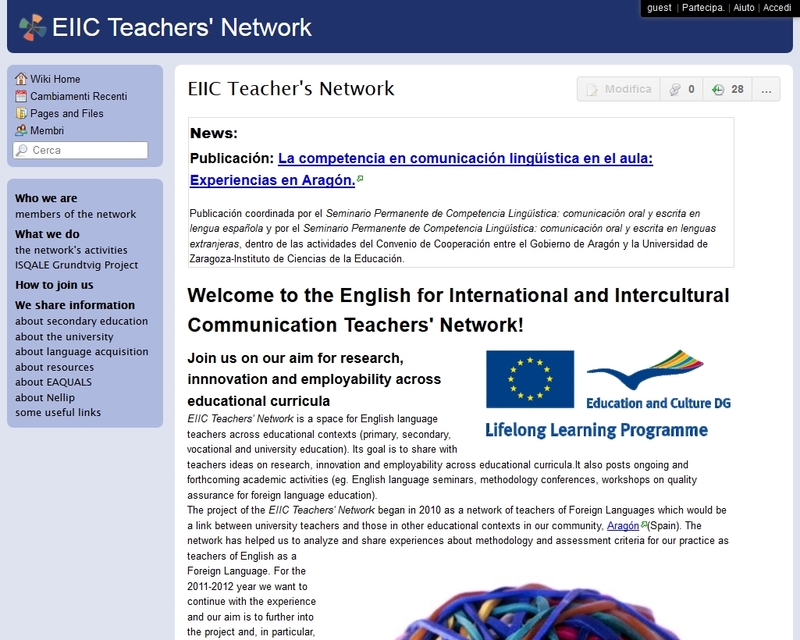 English for International and Intercultural Communication Teachers' Network is a space for English language teachers across educational contexts (primary, secondary, vocational and university education). Its goal is to share with teachers ideas on research, innovation and employability across educational curricula. 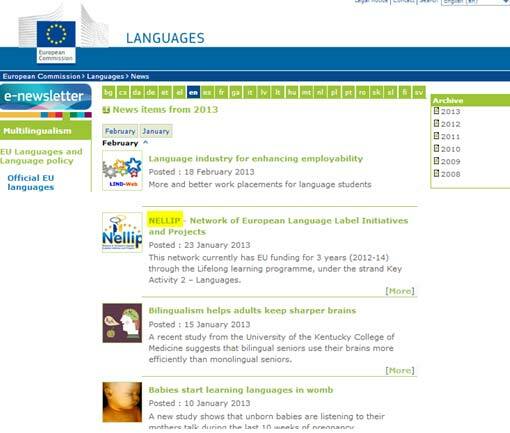 The main information about NELLIP is provided together with a link to the NELLIP portal. 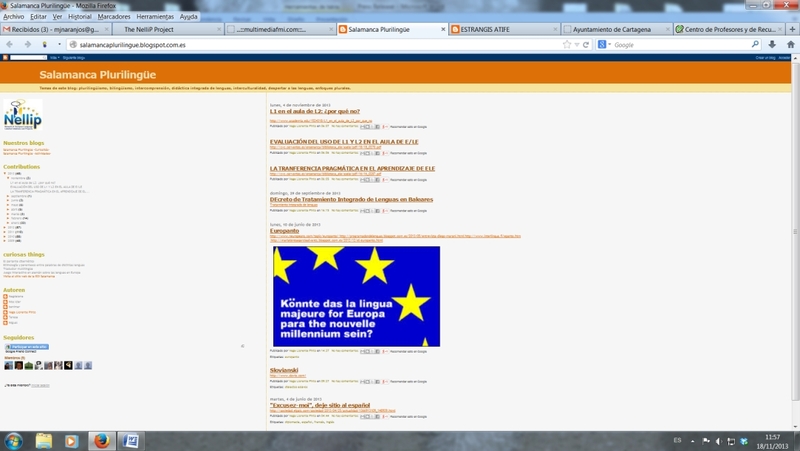 EuropaNu is a Dutch news portal allowing the users to form an independent opinion on how’s the EU affects their lives. 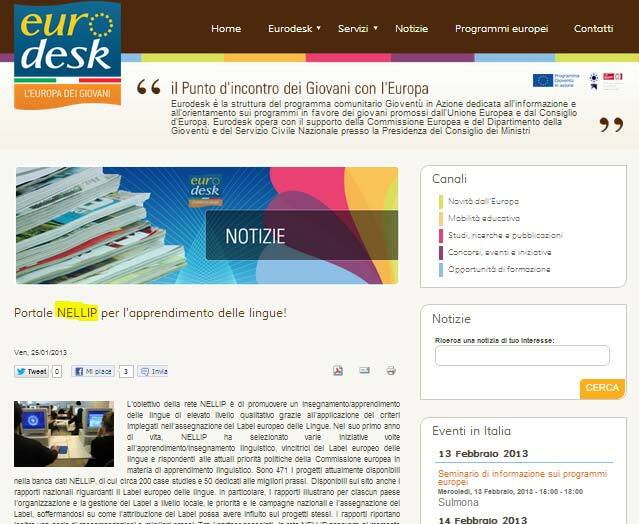 The main information about NELLIP is provided together with a link to the NELLIP portal. Nederlandse Grondwet is a news portal aiming at providing a current and comprehensive overview of the development of the articles of the Dutch Constitution since 1798. 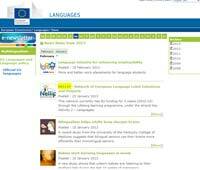 The main information about NELLIP is provided together with a link to the NELLIP portal. 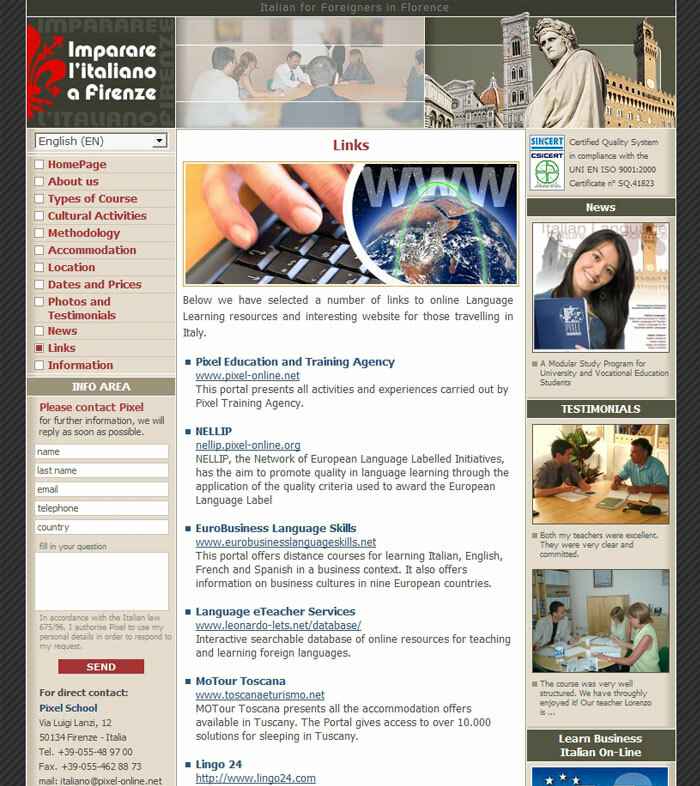 Indire is the Italian National Agency for the Lifelong Learning Programme in charge of the European Language Label. 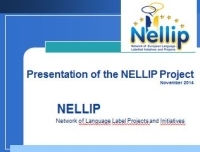 The Italian reference person for the European Language Label in Italy, Lorenza Venturi, attended a round table organized in the framework of the NELLIP project. All the information about the Round Table has been published on the Italian National Agency website. 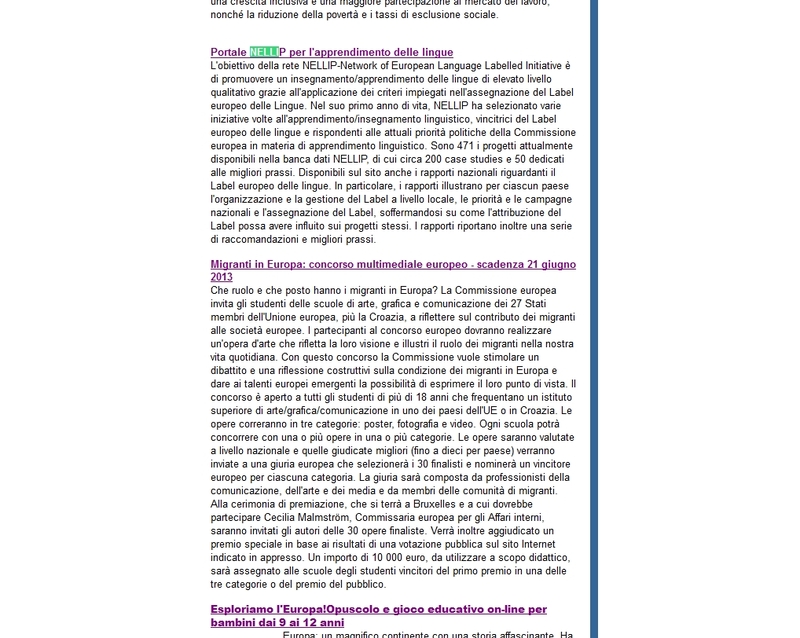 The Europe Direct service of Venice has published an article about NELLIP project in its monthly newsletter. Coordination Régional PACA de la Formation Continue dans le Supérieur is a blog aiming at spreading information about the higher education in the following regions : Provence, Alpes, CÔte d’Azur. 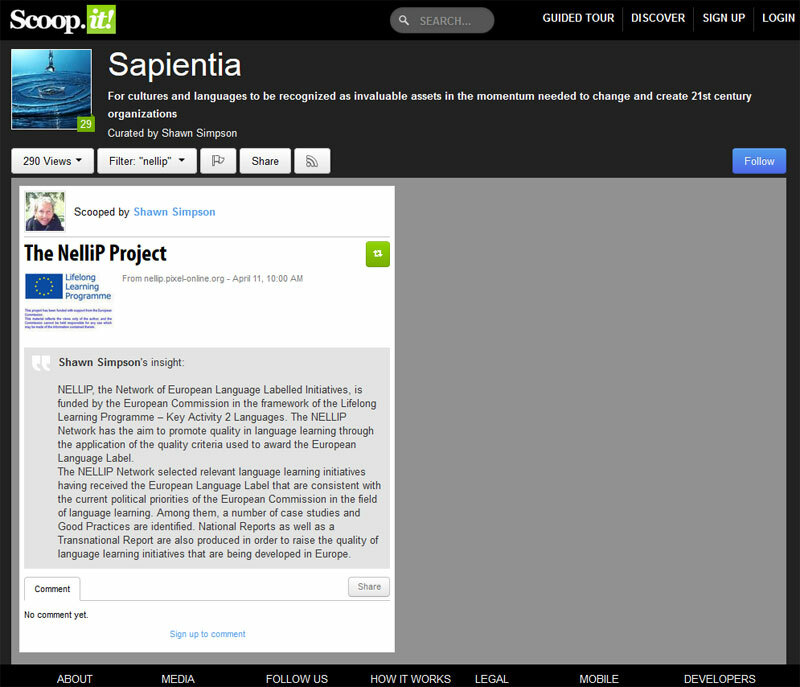 All the information about the NELLIP project have been uploaded on this blog. 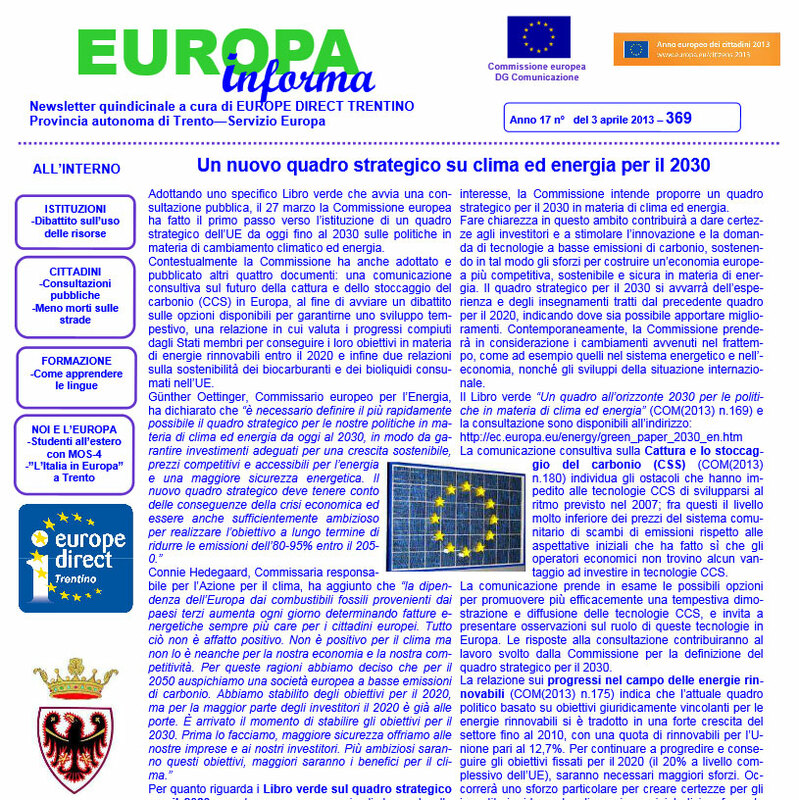 The Europe Informa service of Trento has published an article about NELLIP project in its monthly newsletter. The EuroEd Foundation is one of the most active NGOs in Romania in the field of education, with a focus on foreign language learning, equal opportunities in learning, social inclusion and active ageing. 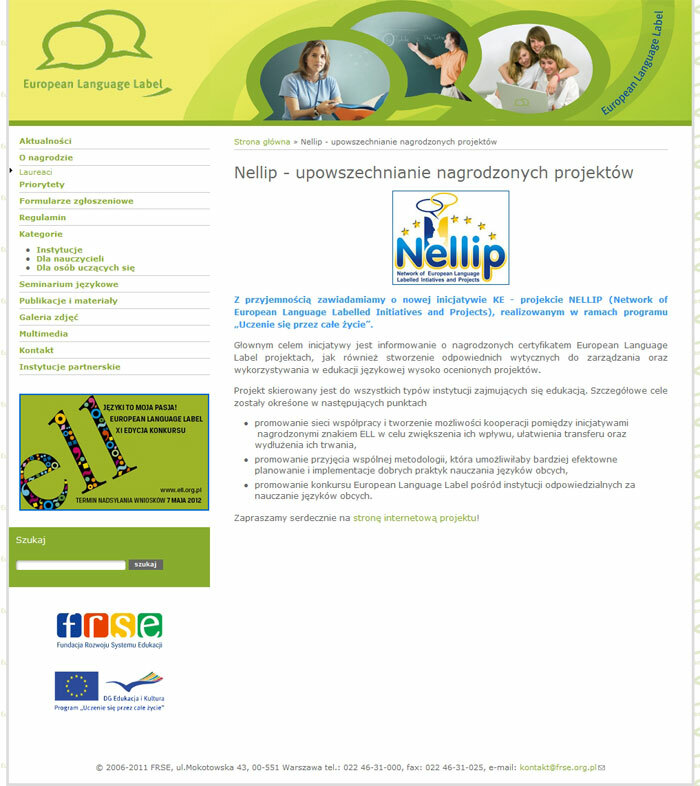 The main information about NELLIP is provided together with a link to the NELLIP portal. 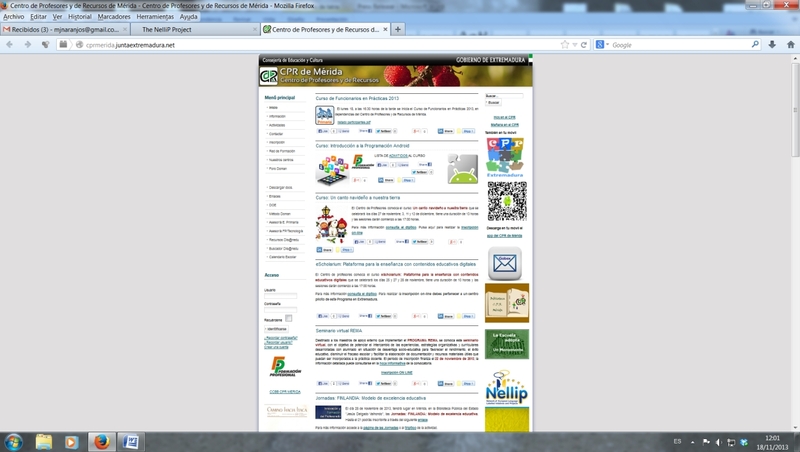 a portal selecting relevant data for specific target audience, published the information about NELLIP. Wofford College was founded in 1854. Still located on its original campus in Spartanburg, South Carolina, Wofford College has become nationally known for the strength of its academic programs, outstanding faculty, and commitment to providing its students a holistic liberal arts education. 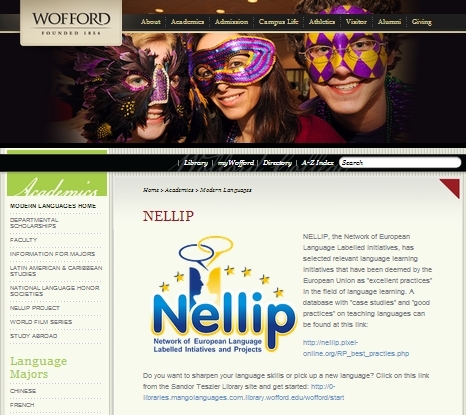 Several information about the NELLIP project, the logo and the link to the project portal were published on Wofford College web site. The Institution of Technology, Electronics, Computing and Communication Ltd. which develops and publishes innovative pedagogic material as well as author tool, under the name FMI, Interactive Multimedia Training, has published NELLIP’s logo on its website. 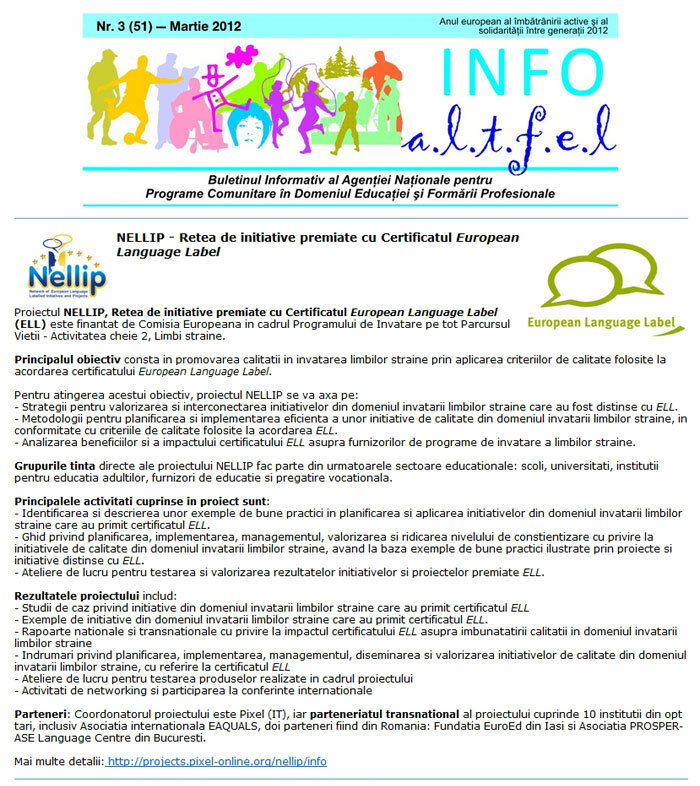 Escuela Oficial de Idiomas de Salamanca is a network member of the NELLIP network because recognizes the importance of its strategic objectives and planned results. It intends to contribute to the NELLIP network through the organization of training seminars, the dissemination of the project results and publication of NELLIP’s logo on its website. ATIFE is a group of teachers of different educational levels interested in promoting foreign languages learning through short plays. 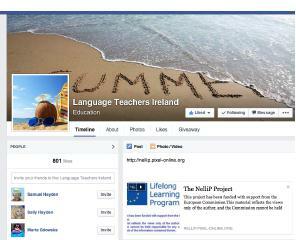 The Association intends to promote the dissemination of the NELLIP through its facebook page and blog where we can find NELLIP’s logo. Espacio Joven is a public service designed to meet the demands and needs of the youth of Cartagena in any area, from employment to housing, health and gender issues, education, social care. Espacio Joven will facilitate the dissemination of NELLIP through its network focused on communication and information technologies (e.g. 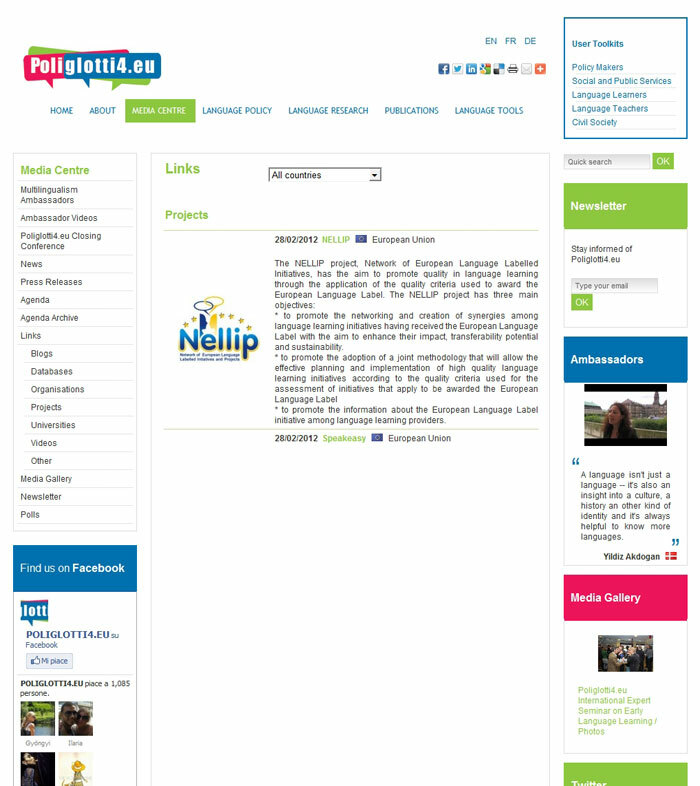 publishing NELLIP’s logo on their website). Centro de Profesores y de Recursos de Mérida is an official institution responsible for the training of teachers of Merida and the surrounding area. Their contribution to the NELLIP network will focus on the dissemination of the project through a link on their institutional website, publication of Nellip’s logo on its web and the arrangement of informative workshops. 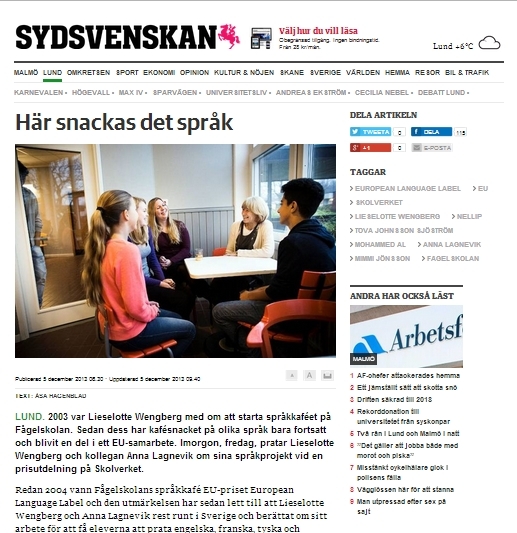 An article about the NELLIP project was published on the Swedish newspaper Sydsvenska Dagbladet. 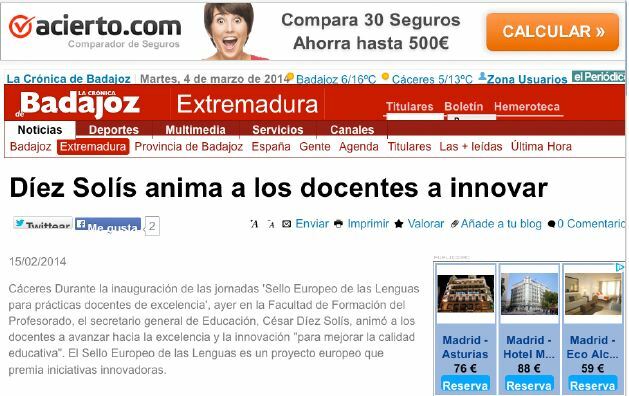 The articles described the activities carried out and those which will be realized in 2014. Learningoffrenchlanguage is an online blog which provides its users with some tips and suggestions about learning and teaching foreign languages. A direct reference to the NELLIP case studies’ section was published on the blog. Between the lines is a project set up as a reading club in two countries, Romania and Greece, in which books were to be discussed using ITC, as a way to establish a bridge between the two countries and cultures, in order to enhance reading enjoyment and to develop students’ interest in literature. 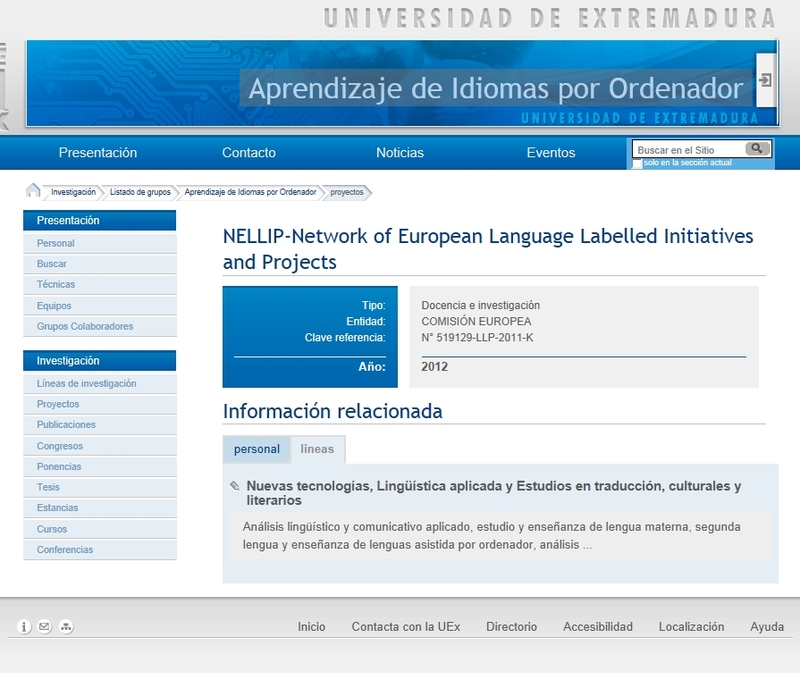 A direct link to the NELLIP portal and the logo were published on the project web site. Hankeet is a Finnish magazine addressed to language teachers. All language teachers involved in the Label Union receive and read carefully this newspaper. 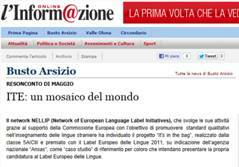 An article about the NELLIP project was published on the newspaper, followed by an interview with the contact person of the National Board of Education responsible for the European Language Label. The article was completed by a brief description of one of the case studies analyzed by the project partnership. 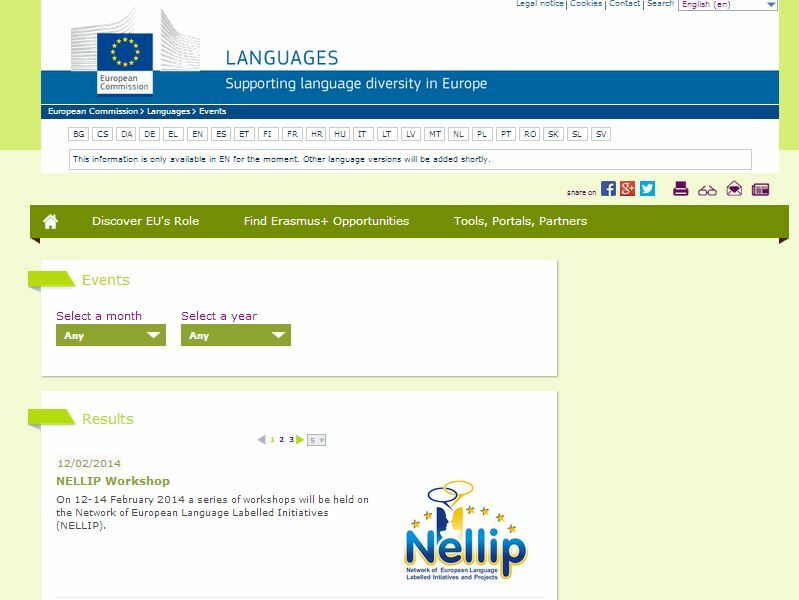 The European Commission’s Multilingualism Unit’s web site has published the information about the NELLIP Workshop organized by the Spanish project partner. The news has been published in the events’ section and a link has been made available. 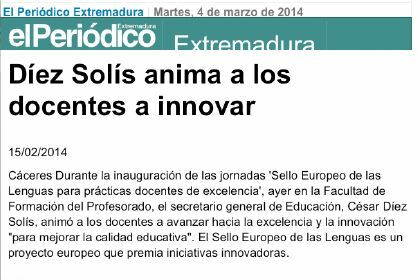 The online version of the newspaper “El Periódico” de Extremadura has published the information about the NELLIP Workshop organized by the Spanish project partner. 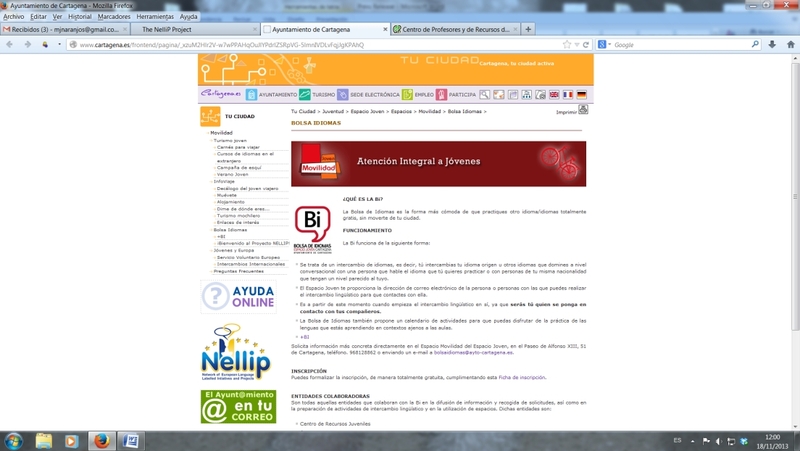 The online version of the newspaper “Crónica de Badajoz” has published the information about the NELLIP Workshop organized by the Spanish project partner. 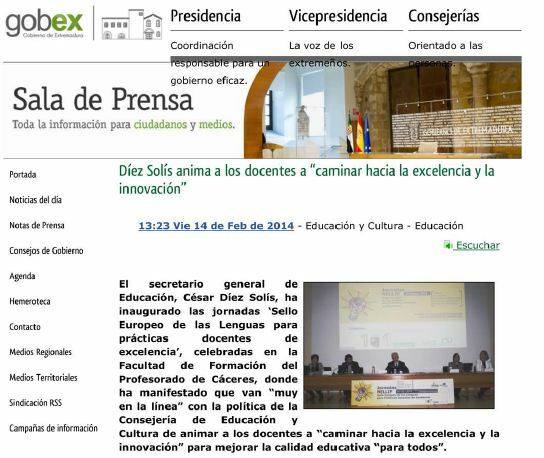 The Extremadura Governorship’ website, entitled “Gobex” has published the information about the NELLIP Workshop organized by the Spanish project partner. 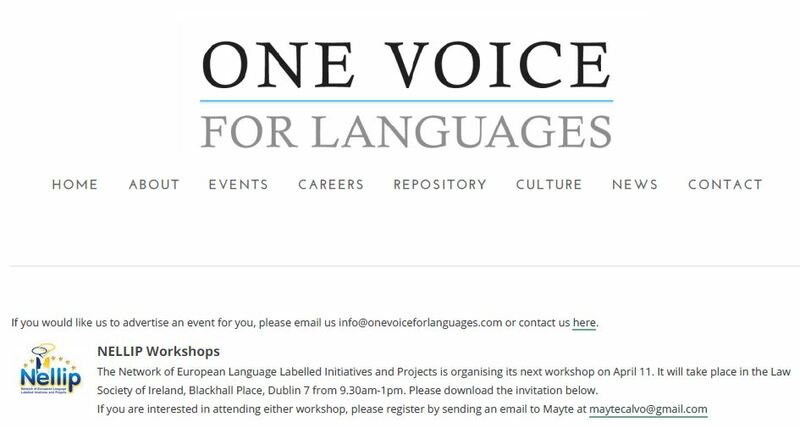 One Voice for Language, an Irish network of professionals who believe that languages are essential, spread information about the Irish National Workshop and made a direct link to the NELLIP portal. Article published in the proceedings of the Scientific Conference "Romanian Agriculture and The Common Agricultural Policy" held in Iasi (Romania) on 24-25 October 2013. During the conference days a poster with presentation of the NELLIP project was presented to the participants. Flyers were distributed. Also an article has been published in the proceedings of the conference, Scientific Works - Vol. 56/2013 Series Agronomy. 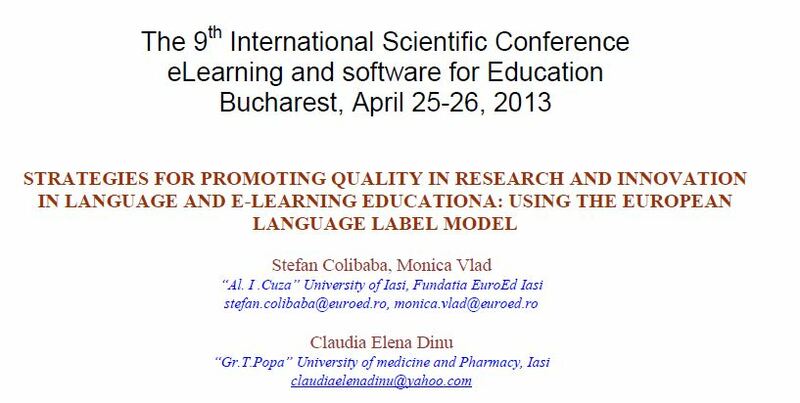 Article published in the proceedings of the 9th International Scientific Conference eLearning and software for Education (ELSE), held in Bucharest (Ro) on 25-26 April 2013. 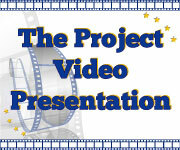 Apart from the formal presentation delivered at the conference about the project perspectives and outcomes (ppt. presentation and flyers), EuroEd also wrote and sent an article for publication (ISSN: 2066 - 026X print 2066 - 8821 online). Article published in the proceedings of the scientific Symposium "100 DE ANI DE ÎNVĂŢĂMÂNT SUPERIOR AGRONOMIC LA IAŞI" held in Iasi (RO) on 24 – 25 October 2012. Apart from the formal presentation delivered at the conference about the project perspectives and outcomes (ppt. 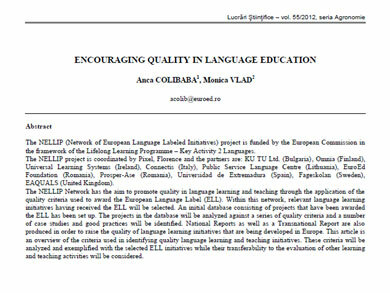 presentation and flyers), EuroEd also wrote and sent an article for publication.The article is an overview of the criteria used in identifying quality language learning and teaching initiatives (vol. 55/2012, seria Agronomie). 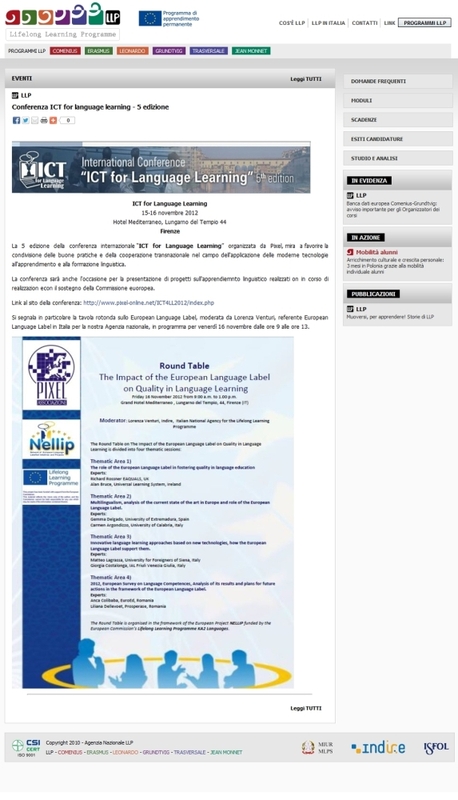 Article published in the proceedings of the International Conference 2014 "Cultural Diversity and Languages for Specific Purposes: Stakes and Perspectives" held in Cluj Napoca (RO) on 25-26 September 2014. 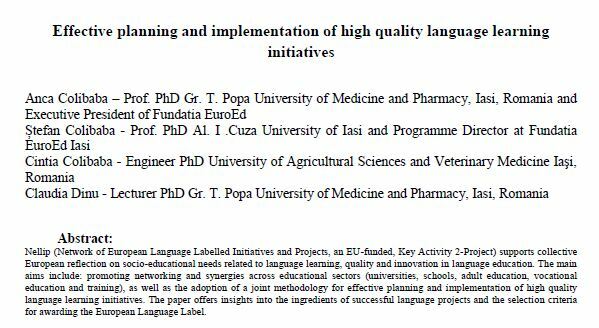 The paper offers insights into the ingredients of successful language projects and the selection criteria for awarding the European Language Label. 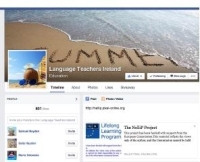 The Facebook group representing Language Teachers in Ireland made a direct link to the NELLIP portal.